Azalea - flowering flower of the Heather family. The period of abundant flowering from December to April. 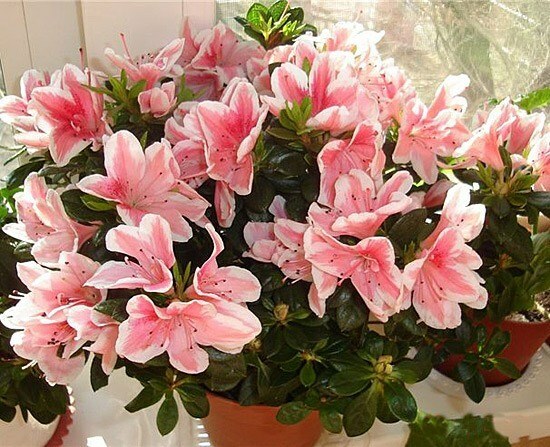 Azalea is very capricious flower that requires a lot of attention, good care. If you put a lot of effort, she will thank you for admiring the beautiful flowers. Azalea loves the sun. Sunlight should be diffused, under the direct rays Azalea is dying. The best place for the pot of Azalea is a window facing South-West. The apartment in the summer, the ideal temperature should be +20 degrees and in winter is 13 degrees. Very hot and dry air does not transfer. Taking care of Azalea, do not allow drying out the land. Make sure that the soil always a bit moist. The ideal time for watering is early morning. When the Azalea begins to flower, watering should be abundant. Alternate watering of the surface and the pallet. The water in the tray, hold two hours, then drain it. Don't forget to spray. When sprayed, cover the buds and flowers. Young azaleas should be transplanted every year. Re-pot it after it Bud. The root ball loosen a little if it is too large, then prune. Transplanted azaleas put in the most shady, warm place. After about 30 days Azalea should be well rooted and give new shoots. To Azalea was neat and beautiful, you need to do topping the new shoots. Make the topping in may. The more often you do it, the more magnificent will be the Azalea Bush. To do this, a young sapling at a height of 10 cm otstegat or tear off the tip. Then, when you grow new side shoots with a length of 3 cm, again priderite them. In summer, azaleas can be put on the balcony or planted in the open ground in a well lit area but not direct sunlight. In winter it is better to water the azaleas in the pan. Often moisturize the air in the room. Primitiva, do not remove flower buds. Buy Azalea with bright green leaves with many buds. When he came to the flower shop for a gift you walk past blooming azaleas, refrain from buying impossible. Beautiful "cap" of delicate flowers fascinating, admirable. However, at home, after 2-3 weeks, the plant suddenly starts to wilt the flowers and then leaves. Eyes it withers, and then dries up. The most common cause of this is incorrect watering azaleas. Azalea – water-loving plant. Best of all it feels in cool, bright rooms with high humidity (80%). It is especially good that it blooms from December to March – when the main part of indoor plants "asleep". However, spraying it, it is important to follow some mandatory rules. In all periods of growth for watering azaleas use soft water. For this purpose, suitable melt or rainwater, you can also take distilled or boiled water. However, if you use tap water, be sure to let it stand for at least a day to the main part of the chlorine had disappeared and the lime settled to the bottom. The water temperature should be around 18 degrees. Every two weeks add water a little lemon juice or citric acid solution (0.5 teaspoon to 1 liter of water). This water is made by spraying the plants. In the flowering period, watering should be abundant and uniform is provided. Watering azaleas from a watering can, ensure that clod was some dry evenly (from the surface to the bottom). However, avoid overwatering can rot the roots. Spraying of plants in this period is not recommended to prevent spotting on the flowers. If however, there is a drying clod of earth, put your pot of flowers in a basin of water. The water level should be one-third the height of the pot. Leave it on for 3 hours, then remove and allow the excess water to drain. Resuscitation of the completed flower, you can put him in his place. In summer, after flowering, watering is 1 time per two days, are also plentiful. Local anesthesia is sprayed on the flower at least twice a day. This is necessary to maintain the humidity in the room. If the room is very warm, use for cooling the ice. They can impose pot or gently placed on the surface of the earth on the edge. In the fall, two months before flowering, azaleas placed in a cool place and reduce irrigation. However, the dryness is still unacceptable. Daily need to spray the flower to maintain humidity at the proper level. Airing the room, avoid drafts – Azalea doesn't like them. Azalea – flowering plant of the genus rhododendron. The intensity of growth and flowering of azaleas, as well as the height of the Bush plants are determined by conditions of their cultivation. 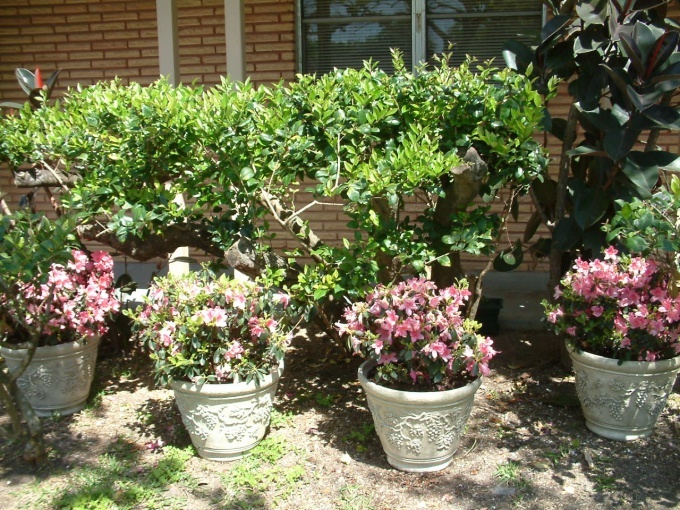 Azaleas require moderate watering and bright sunlight. In summer, the azaleas should be sprayed with water and watered more liberally. The flower buds are formed at the ends of annual shoots, when they are healthy, short, thick and have dark green leaves. These shoots grow only in bright light plants and low winter temperature of 12 16оС. The crown of these flowers are cut in different ways. It all depends on the varieties of azaleas. Some varieties grow better after a good pruning of the crowns after flowering, and the other should be cut carefully and slightly. During flowering azaleas pluck shoots that have appeared near the buds. When the flower starts to wither, it should be nip. During this period, prune the crown of the plant to form its beautiful shape. If your plant is not prone to the formation of long branches, the shape of his crown, only primitiva growing shoots. So you remove only the top of the escape. Weak shoots better to remove completely by cutting them at the base. So Azalea had a beautiful shape of the crown during flowering, constantly watch its growth and do pruning. Notice how the plant recovers after this and lays the buds. If your Azalea tall, trim it more if it has short shoots, only crawl pinched. Sometimes azaleas bloom well without much pruning. This usually happens when you complied with the conditions of wintering of plants and a pre-flowering low temperature, good lighting, adequate humidity, moderate watering and good plant growth in the summer. Azaleas usually have to place the flowers after drying them Wake up vegetative buds. Of these two or three buds develop new shoots. If all sprout from the buds, then one of the shoots may significantly lag behind in growth. Such a weak sprout, you can remove or pinched his tip at the beginning of the growth. Dwarf types of azaleas can not be subjected to pruning and topping, if you do not see any shoots-Champions who'll be ahead in its growth and disrupt the shape of the crown of the plant. Time presidnete such "upstarts" top pochacco, and they will cease to outperform its counterparts. Your Azalea will once again be perfect.